THis may be a dumb question, but when Elizabeth I was ruling, wouldn't the "kingdom" be known as a "queendom"? After all, the realm was being ruled by a queen, not a king. I am writing a novel of historical fiction about Elizabeth I, Walsingham and the Tudor period. We know that the queen owned and lived in several castles, but where was most of the "business of the kingdom" conducted. Today, we have specific locations such as the West Wing of the White House, where the American president conducts the actual management of the country, or Whitehall in England where the modern prime minister performs similar tasks. Where would the queen's ministers such as secretary of state Walsingham and other members of the Privy council write orders, hold meetings, etc. Was it several places, or one did one location contain most of the meetings? This is very hard to determine from most historical references. Since the queen was the official head of state, wherever the royal person was, so was the government. But the "business end" of the government had to be conducted somewhere, and these seems hard to determine. The home offices of individual ministers is also known, but where did they usually meet in the late sixteenth century? There have been arguments ad nauseum about the birth year of Anne Boleyn. I'm a member of the "1499 to 1502" faction because an earlier date is better substantiated: her appointment as maid of honor in 1514, her handwriting that year (http://www.nellgavin.com/boleyn_links/boleynhandwriting.htm), and remarks by her contemporaries that she was about "20 years old" when she returned to England from France in 1522. The 1507 faction always presents arguments that she "could" have written a long and nearly flawlessly written letter in adult handwriting in her second language when she was seven years old, that Henry VIII "would" have preferred someone younger, and that Margaret of Austria's remark in a letter that Anne conducted herself well for someone her age (without mentioning what that age was), substantiates a 1507 birth year, presumably because age seven is "young", whereas age 11 is not. Not good enough for me. When you bring up the handwriting and the fact that you won't find a modern 7-year-old who can write that well, the primary argument is that Anne Boleyn was very smart. I'm a member of Mensa, and I could not write that well at age seven. I conducted an informal poll of other Mensans on the Mensa forum, and they couldn't either. So, even if Anne were a genius, it's unlikely that she had the mechanical ability to write like an adult at age seven. The second most common argument always that the Tudors taught their children more strenuously than we do today. I can't comment on that because I simply don't know. I've never found anything on the subject of Tudor tutoring methods. So, I would like to present a challenge. Has any Tudor historian ever attempted to replicate the teaching methods employed by the Tudors to produce a "super child" who could write a long letter with nearly flawless penmanship (spelling wasn't standardized in French in those days, so that wouldn't count) in her second language at age seven? Do they know what those teaching methods were? If these methods were so effective, why are educators not employing them now? If they replicate those methods, and researchers can consistently produce genius children just from using Tudor teaching methods - or even use those methods on children who have been identified as "geniuses" before the experiment and produce results similar to Anne's letter in 1514 - it would provide substance to the arguments for a 1507 birth year. And if they cannot, that might settle the argument once and for all. Has someone ever conducted this experiment, and if so, what was the conclusion? And if not, would someone be willing to try? Or to at least define and describe Tudor tutoring methods? I've never seen anything that went into detail about the precise methods they used when they taught their royal children, and I'd be interested in knowing what they find. I'm sorry if this question is somewhat inapropriate but I need the answer to put a long-running debate with my History teacher to bed. In all my tudor reading I have encountered 'the groom of the stool' a number of times. However; whenever I have read of the particular post there has been plenty of reference to 'emptying' and nothing whatsoever mentioned to do with 'wiping' (if you catch my drift). Is it the case that the groom's toiletary duties extended further than just emptying it when the king had finished? I know they made a "death mask" of Elizabeth I, and I was wondering if anyone knows if Henry VIII,or Anne Boleyn, also had a "death mask" made of them or perhaps these masks were only accepted in the era of ElizabethI? I've got some questions about the signature of Elizabeth I. Before she became Queen she would sign her name with a little square with looped corners and what could be a capital "P" following her name. This mark is similar to the "R" for Rex in the signatures of Henry VII and Henry VIII. Could it possibly mean Princeps (Princess)? She was an heir to the throne according to the will of her father and this could have been a statement of her rank and legitimacy. 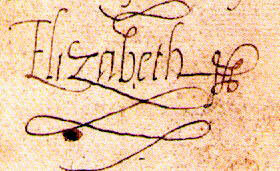 And finally, did Elizabeth ever sign herself "the Quene" as all the other Tudor queens did (except probably her aunts, Margaret of Scotland and Mary of France)? I remember reading in one of Alison Weir's books that one of Queen Elizabeth's ladies was apparently offered a hand in marriage by the Russian tsar Ivan the Terrible. I haven't read that book about Queen Elizabeth in a while, but I was wondering if anyone here knew if that marriage proposal actually happened. Also, did England and Russia back then have any communication with each other? Ever since I heard about that marriage proposal, I've been wondering if England and Russia ever really communicated with each other in trade or anything. I know that Sir William Cecil was a great advisor to Elizabeth and she relied upon his wisdom. My question is how was he regarded by the noblemen since he seemed to have spies everywhere, and everyone was suspect to their loyalty of the Queen. In Phillipa Gregory's novel,'The Other Boleyn Girl,' Anne Boleyn went to serve in the French court by herself and was not as close to Mary as it appears Robin Maxwell thought in her novel, 'Mademoiselle Boleyn.' I do understand that Ms. Gregory's is written from the other sister's point of view, but it gets so confusing with every author putting out different stories. So, my question for you, which one's right? Did Anne and Mary become closer after living several years together in the French court? In fact, I have a couple more questions written down that I would like to ask you. In Maxwell's novel, 'Mademoiselle Boleyn,' Mary and Anne are sent together to France to serve under Mary Tudor. Their father keeps them there and according to Maxwell, Anne and Mary were even in the presence of Leonardo Da Vinci. Is it so? Robin Maxwell also sees that Mary Boleyn is Francois', the French King at the time, mistress for at least over a year. However, I thought that in, 'The Other Boleyn Girl,' Phillipa said that Mary lost her virginity to King Henry, since her first husband did not desire her. I realize that these are questions more likely for the authors to answer, but some feedback from people that will actually respond to me would be fantastic- especially those of you coming across this site! I am NOT doing this for a school project, but I am a ninth grader in Indiana. If you could just please give me some answers, or explanations, I would be forever grateful--oh, and sorry about making this so long! I remember reading somewhere--can't remember exactly where--that although there is a death date for Mary Boleyn documented, there is no record of where she was interred? Does anyone know where she might be buried? What do you think would have happened if Anne Boleyn had succumbed to the sweating sickness and died? Would Henry have gone back to Katherine? I'd be interested in opinions.. So for an A level assighnment, i've decided to look at the death of Amy Dudley/Robsart and who would have the motivation to murder her. I've got good basic knowledge. But i'm struggling to find quotes from historians stating there views. Just odd words that i can use to infer their beliefs on the topic. Please help? I've been looking for 2 months, and haven't found anything. and i really enjoy reading as much about the tudors and any english royal house in general. does anyone have any suggestions as to what books like those i could find that are availible in the US? thank you! Hello, my 9 year old son has a homework assigment to portray the differences between rich & poor employment during the Tudor period. We live in a very small country with no research libraries. We have not had any luck finding information on jobs via the web. Any suggestions? thanks! Does anyone know if during the reign of Henry VIII and Elizabeth I if any men or women were known homosexuals,and if so, how were they treated? Were they banished or allowed to remain active within the social activities without being made an example of prejudice? My name is Amber I am 17 and I'm a senior in high school. In order for me to graduate, I'm required to give a "Senior Project". This past summer I visited England (which I visited Hampton Court), and that was the start of my fascination with Tudor History. I then realized that I wanted to do my project on Anne Boleyn. I read "The Other Boleyn Girl." and watched the movie too. I've done a little research just to familiarize myself with her life. For my senior project, I need an Interview... I wanted to post a few questions for my interview on here in hopes that someone would be so generous to assist me with them. If you do answer them, I will need your name, it's required for recording my interview. If you would like to personally send your answers, my email address is adeamb@live.com – I must not fail to mention, my interview MUST be handed in on the 16th of March. [Note from Lara - I've decided not to post all the interview questions here, so if you are interested in helping Amber out please contact her directly (her email address is in the question above). Also, if you volunteer, please post something in the comments so everyone will know. Thanks! I am reading "bloody mary" by carolly erickson. she states that princess mary became "princess of wales," the first girl to beknown by that title, officially. the footnote says "lord ferrers, steward of mary's welsh household, referred to her council as "the prince's council. L.P. IV:i:ii, 830." i had no idea she was princess of wales? I have read that Mary Grey, Jane Grey's sister, was a hunchback. What exactly does this mean? Did she have some type of physical deformaty? This is a question concerning architecture. "...oak bargeboards in the cobbled courtyard are carved with twining branches carrying the Tudor rose of England, the fleur-de-lis of France, and the pomegranate of Granada, the badge of Henry VIII's first wife, Catherine of Aragon. This armorial decoration was overseen by Ightham's owner, Richard Clement, in 1521." Was jane seymour pretty or ugly? Has anyone read an advance copy of Elizabeth Norton's biography of ANNE BOLEYN, due out in February? can anybody help me. I am trying to find the average time for a voyage from England to Spain during the reign of Henry VIII. Thanks. Further info from Ann: What I'm looking for is the approximate crossing time from Tilbury to Bilbao to be more exact.